, the German First and Second armies fell back through France. According to The Illustrated London News, the Germans fought for every inch that they thought was defensible, but were ultimately pushed back to the heights of the Chemin des Rames Rigde behind the River Aisne. This was an obvious position for them to halt their retreat as it provided a natural defensive position and much needed time to reorganise. Analyses have suggested that the Allies could have made much greater gains if the victory at the Marnehad been exploited and they had continued to push their attack against the Germans. French General Joseph Joffre, certainly wanted to press the attack, but it was physically impossible for the fatigued and exhausted troops to continue their struggle at a hurried pace. By the time the Allies reached the Aisne on the 12 September, the Germans had managed to entrench themselves along the Aisne’s northern bank. A day later the Allies launched a frontal infantry assault on the Germans defensive position, and “the Siege-Battle of the Aisne” began. German counter-attacks began within hours of the offensive, and the Allies were forced to dig directly in front of the German trenches. in 1918, yet little is mentioned about it in the pages of The Illustrated London News. Its significance was only recognised once the Western Front was established and defined by an inexorable state of stalemate. 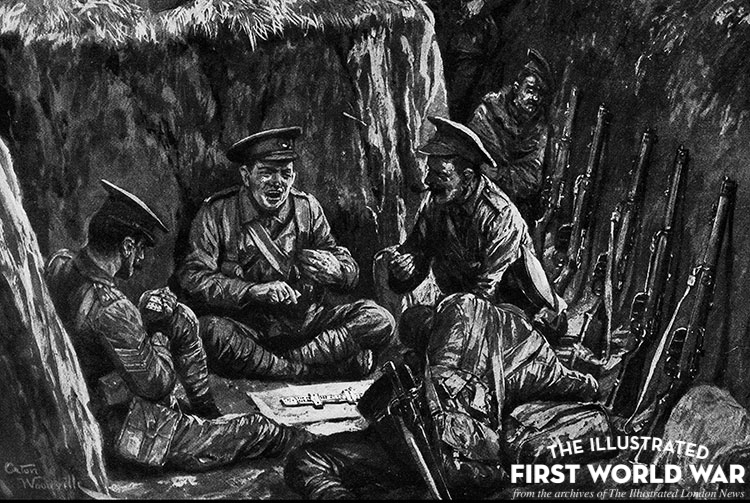 Though trenches were mentioned in the pages of The Illustrated London News from the very start of the war, the Battle of the Aisne, the Race to the Sea and the First Battle of Ypres were the events that turned the First World War into a war of attrition. The articles that emerged from The Illustrated London News and The Sphere in late 1914 illustrate this. Reports such as “Tommy in the Rabbit Warren” focus on the trench-element of the battles and indicate that trenches were beginning to define the war for the armed forces and in the minds of the general public. to browse the archives for articles related to the Battle of the Aisne. In the Trenches at the Aisne:"Tommy" in the "Rabbit-Warren."